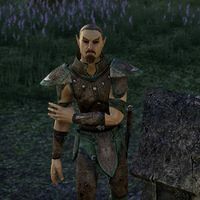 Rolancano is an Altmer member of the First Auridon Marines attempting to get his children back. They are being held captive by the Veiled Heritance at the Elven ruin of Quendeluun. The Veiled Choice: Rescue a Marine's daughter from the Veiled Heritance. "A member of the First Auridon Marines. I serve under Battlereeve Urcelmo. I'm currently on leave. My wife passed, just recently." "The Heritance—again. I was assigned to Queen Ayrenn's detail, so my wife went to stay with her sister in Silsailen. The city was sacked and they were both murdered by these bastards." "I've lost enough to the Veiled Heritance. I won't lose my daughter. Please. You have to find her." Why didn't you just sneak inside with the elixir? "How would Palith get out then? I'm a better alchemist than a fighter, as you can see here. Least I know how to make a man talk." Find Palith and bring her back to him. "What? He ... my son is a traitor? He gave deployment plans to the Heritance? And the Pact?" Palith: "Look father, it's Eranamo!" Rolancano: "You! I told you I'd kill you if I ever saw your face again!" Eranamo: "No, father, don't get upset! Please, I... I never meant to hurt anyone!" Rolancano: "You deserve no forgiveness. Lorkhan take you!" Palith: "Father, no!" She turns to you. "Please, do something!" And the only possible solution is death? "No, I have to. I must—my son. My own son! How can I kill my own flesh and blood? Rolancano: "Eranamo, I am a First Auridon Marine. It's my duty to carry out the punishment for your crimes. Treason and murder, the sentence is death. Do you have anything to say?" Eranamo: "I'm grateful. How can you treat your own son this way?" Palith: "Father, no! Don't do it!" Eranamo: "Yes, listen to Palith! You'll regret this!" Rolancano: "The Eight may grant you mercy. I cannot." If Eranamo was spared, he'll say, :"Could it be I made the wrong choice?" "A hundred years with the Marines and never before have I failed in my duty. Until today. I know myself, though. I would have come to regret killing Eranamo. Thank you." If Eranamo was killed, he'll say, "Could it be I made the wrong decision?" "At least he was slain by the sword of his father. In private, rather than in public by a hooded executioner. Cold comfort. Thank you." Talking to him after completing the quest, he'll say if Eranamo lived, "I hope the Stars - and the Queen - can forgive me. I don't know if I ever will." If he killed Eranamo: "Palith will come to forgive me in time. I may not ever forgive Eranamo." This page was last modified on 15 October 2017, at 16:23.